This highly productive fisheries, did not disappoint us in a new incursion. Fresh waters are home to mullet, croaker, and large black. Image gallery. Since end of September flounders are present in the mouths of the lagoons in search of food and to procreate, staying in veriles and merging with the sandy bottom in search of food. Mar Chiquita is one of the traditional destinations for fishing of this species. With an area of 35 km long, its waters houses enough for sole food. Crabs, silverside are your favourites, but also attacks lures and spoons when they pass near their colony. DAB there coexists with smooth and croakers, some large black. The waters of Mar Chiquita are sweet, taxed by streams, canals and rain mixing with the sea when it grows. In addition, in its sandy soil form large amount of bochones, making navigation difficult. Sole is a flatfish, oval and symmetrical shape. You spend your life practically on the background. The part that exposes is Brown, that serves to blend in with the sand. And its bottom edge is white. It has small, very thin, barely visible scales. The eyes are located in the dark area of your body, and your mouth is protractile and toothed. The average weight of extraction this time varied between 1 and 3 kg, but in previous surveys we took major ports that came to 6 kilos, having records indicating that it can overcome the 10. Mar Chiquita is fishing to DAB from vessels moving trolling or anchored, with kayak anchored on veriles or coast, usually tucked in the water with waders to protect us from the cold and crabs that abound in the background. Using lines from one or two snoods, armed nylon 0.50 mm of 0.70 to 1 m long. It is empatilla a hook N ° 4 to make it work sliding on nylon, 1 or 2 attached loco is topped with a triple N ° or in fixed (indistinct), and adds a buoy olive type girl, usually white, between two slip knots: makes bait is off the bottom, avoiding crabs to take it. Top can be placed without buoy, since usually it comes closer to the surface. Boys leads, no more than 60 grams and elongated shape, are used for dragging it not lift much grit. It is important that swivels are used to tie the snoods, then we will avoid to twist when the line is working. Another significant issue is the bait. Used exclusively silverside, which should be cool. Embodies whole (of a size between 10 to 13 cm) or in fillets. Incarnate is simple: simple hook the Silverside is threaded by the head, being able to pass through the eyes or mouth, by clicking the upper lip; in the triple it nails close to the tail. To fit on the branch line stretches, running the single hook where we head. Presented after ata is the head with elastic thread so that it will not disturb. The filet is punctured in the simple hook of skin leather and by the narrowest. Then stretches and moves three times giving a separation of 13 cm. Then it is tied in the single hook, leaving the bait already ready to start fishing. Vicente Capola was waiting for me on the boats at Mar Chiquita, compared the two seas fishing down. For my part, he had traveled together with Leonardo Giménez. To find us, Vicente made me an overview of techniques that we be. Troleariamos at first towards the mouth, where Leonardo would be fishing coast. 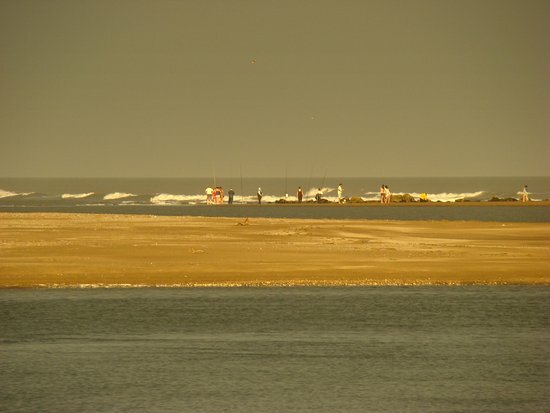 The lagoon was growing, nothing advisable tide for coast fishing, but trolling would be possibilities. We set up the rubber boat driven by a small motor ideal for this type of fishing, and climbed already armed teams: no more rods 3.00 m, Rotary reels loaded with nylon 0.35 or equivalent multifilament. Vicente would use a line of two snoods and Leonardo of only one, that with the perfect encarnes were put into action. We support the lines in the water, unwinding the reel so you away from the ship at a distance of 25 m or more. Then lock the reel and began to work the line in search of sole, with rods open so that the lines are not tangle. Vincent walked the bait the veriles between sandbars, which at that hour of the morning and growing were submerged. And he also did so directly on the background. The bait must pass near where DAB is bet to make it. Usually, located in countercurrent veriles, waiting for the downspout to drag the silverside from the lagoon to the sea. There were already a lot of amateurs taking position, awaiting the downpipe. Besides wader, it must carry refrigerator to keep the bait, posacana with hook and a snowflake to lift it. Ends of the reeds vibrated due to the plumb line. Vicente had a touch that tore him its deepest ganging silverside. At one point he said that we were going through a good area and to draw attention. He was right: Leonardo sugarcane bow, so it stopped it to nail. And it was slowly bringing it to the boat. Vicente had already prepared snowflake. It was a good sole about 4 kilos, came head to snowflake. Everyone celebrated because we knew that the fishing was difficult. She played quickly and returned to the trolling. On the way to the coast had other attacks but no luck. Arriving at the Bank we landed and got the ammunition for fishing. Already the sea was down, so we offer to try from there. The technique is different, since the line is thrown back running up forward, it is made to derive the current, cane back is operated the rig will slide by the Fund, collecting the loose nylon to straighten the rod. This action is repeated until the line appears to start. Generally, it should be placed where begins the Ridge, by action of the current line will lie on the same, and angled outward, it is triggered on the ridge. The beginning of the downpipe activated to flounders, gaining several on both coasts. With Vicente we decided to look for other fisheries and we headed towards the bridge of Celpa. It is a very good place given that the water of the lagoon coming in downpipe is encased in the width of the bridge (about 50 m), and there passes lots of mackerel that spread towards the mouth. Upon arrival we anchor near a coast. The technique is the same as described earlier for the Bank. We made several sets without answers, so we decided to trolear while we returned. Vicente has very clear where to go, looking for veriles and allowing us to collect some more, all sole medium. To return to the mouth, already it was quite down. Leonardo managed to catch some more, but all minor ports. We decided to terminate the journey. Returning to the pier we find Pablo Risso, another specialist of the place, which had been fishing boat with very good catches of sea bass, whiting and brótolas. This confirmed that Mar Chiquita offers all the variants for the visitor. Shipped within the albufera: flounder and smooth; onboard sea inside, a wide viariada, and also fishing varied from coast. I like that nobody will go empty-handed.